This is a set that i am really happy about. Wenger SAKs are no longer made and just by this set you realize just how much this Brand put into the philosophy of knives. 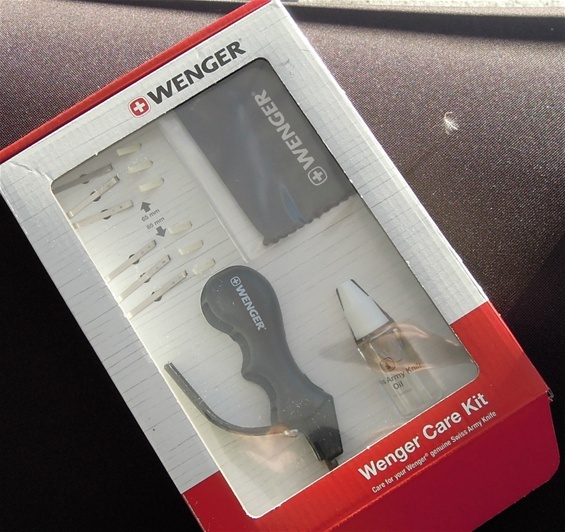 This set is called Wenger Care Kit and I will explain my thoughts on it. 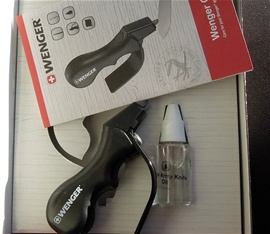 Swiss Army Knives use special oil that is custom made for the sandwich slip-joint construction. It is a type of oil that typically is not harmful and that it got the consistency that makes sure it will stay located and protective for a long time. It will make sure the functionality is correct. The Diamond Carbide sharpener is very useful and easy to use. I have tested several carbide sharpeners with similar construction over a period of 10 years from various Brands. This one is made in the USA. In this set there is a cleaning cloth as well. There are also 6 sets of toothpick and tweezers with 3 sets for 65mm SAKs and 3 sets for 85mm SAKs. It is a relieving feeling to have spare toothpicks and tweezers. Since I am a collector I find many used knives that these are missing. Underneath the sharpener, oil and spares there is an instruction manual for care tips. This Set is to me a very valuable one because over the years I have cleaned and sharpened SAKs over a thousand times without any doubt. I use the knives frequently for all my hobbies and tasks. This type of sharpener is very handy when you need to sharpen fast and ready. It is not a type you want to use with a very dull edge or when the edge is completely gone. It will set the edge up a bit and it is mostly a type of sharpener that fit best by using it frequently on an edge that is just getting a bit dull and use it to uphold the sharp cutting edge. The Diamond carbide inserts get the edge razor sharp quickly.